We're more than an assessment software company... our focus is ensuring that what your employees learn is actually applied. We deliver assessment solutions not just an assessment software! More Than a Testing Software and More Than What an LMS Offers! Assessment systems currently in the market are designed by "software engineers" not by learning professionals. This is the LearningSource difference! Your LearningSource.ams experience delivers a clear difference between simply using a "software" and actually implementing a focused learning application. And, if you currently use a Learning Management System you know the assessment component is designed as an after-thought and often ineffective. 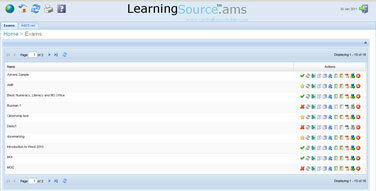 We are exceptionally confident in LearningSource.ams that we will let you use it for FREE! We encourage you to "kick the tires" and compare us to other comparable offerings! Administrator, Designer, or Test-taker...Your Role is Simple! Our assessment system is an intuitive process focused on learning application no matter the role. More importantly, you decide the roles...not the system. From setting up an examination environment to test and question building, you control and match the need of each administrator according to their responsibilities. For test-takers, simply log-in, take a test and obtain immediate results, feedback, and learning guidance translating to improved productivity and performance results. Why Pay for Features You Don't Need. Comparable systems require hefty investments in terms of purchase price and implementation costs. This commits you to a system accepting its faults and the features you don't need. With LearningSource.ams you decide on what you need and when you need it. Start out with a subscriber-based LearningSource.ams Cloud and then, when ready, progress to an appropriate system implementation. If you don't know what you need or don't see it, ask us. We will help you discover the best fit! Take Us Up on Our NO RISK Evaluation. Are you serious about your employees making a difference in their jobs? Are you disappointed with other applications? Try LearningSource.ams out at NO RISK to you. Use the LearningSource.ams Cloud for 60-days and decide for yourself... no obligation to you! Looking for something more specific? Our team will design something just for your company. Contact us. Our team of learning professionals are there to help you get started. We offer free set up and tutorials to build effective testing processes.